This year’s Monitoring the Future (MTF) survey of drug use and attitudes among American 8th, 10th, and 12th graders continues to show encouraging news, with decreasing use of alcohol, cigarettes, and many illicit drugs over the last 5 years—many to their lowest levels since this survey’s inception; no increase in use of marijuana among teens; decreasing use of synthetic drugs; and decreasing misuse of prescription drugs. However, the survey highlighted continuing concerns over the high rate of electronic cigarette (e-cigarette) use and softening of attitudes around some types of drug use, particularly a continued decrease in perceived harm of marijuana use. Despite the ongoing opioid overdose epidemic, past-year prescription opioid misuse (reported in the survey as ‘narcotics other than heroin’) continued to decline reflecting a significant decrease over the past 5 years. 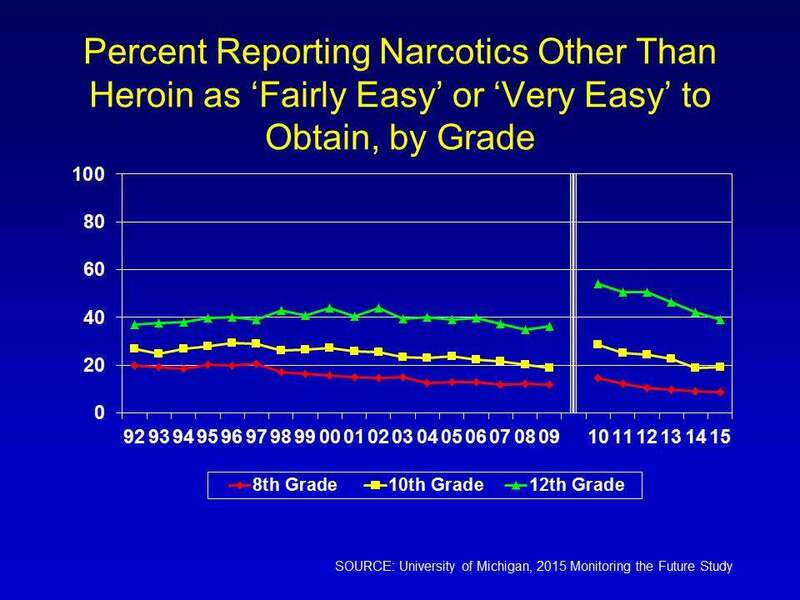 In addition, heroin use is at the lowest rate since the MTF survey began in all ages surveyed. There was a continued steady decline in the perception of availability of heroin among all ages surveyed despite increasing use among adults. 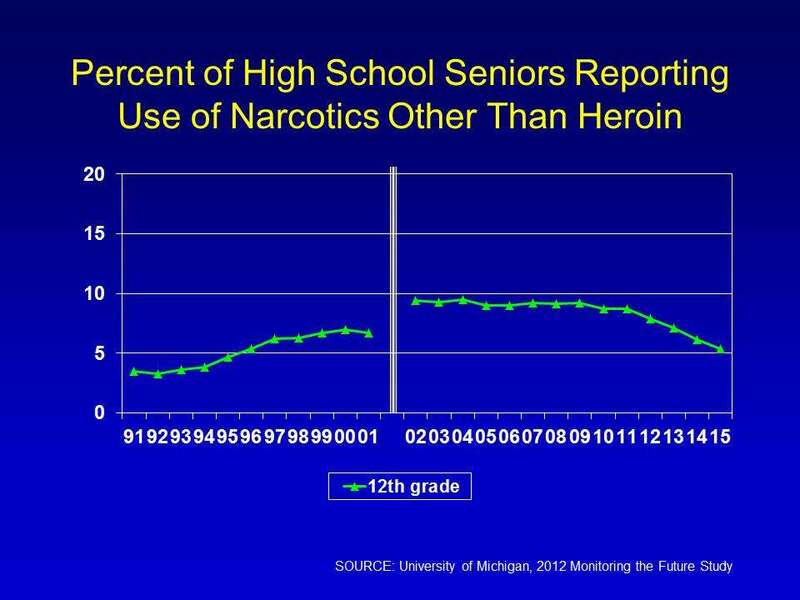 There is a continued high rate of disapproval of taking heroin occasionally—95.3 percent among 12th graders. 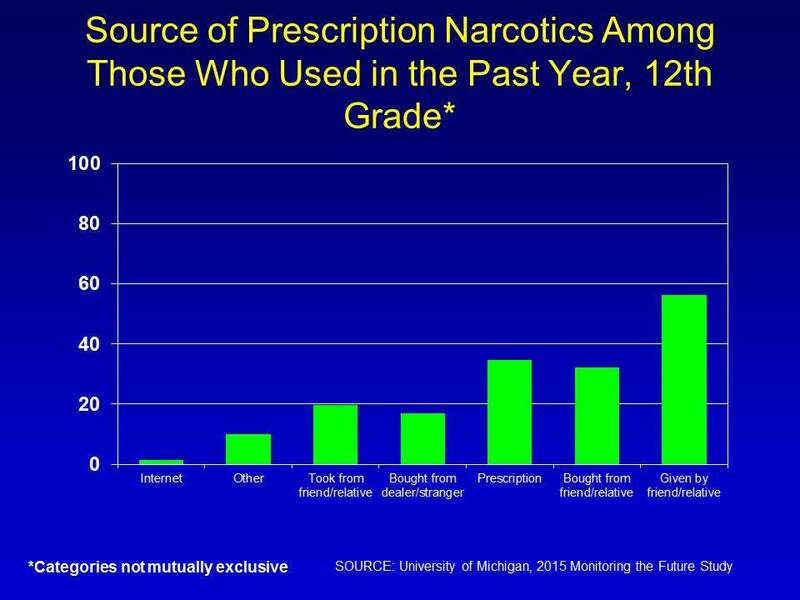 For many substances, past-year use has declined to the lowest levels since MTF survey began. This includes heroin, synthetic cannabinoids, Vicodin, methamphetamine, amphetamines, inhalants, ecstasy, alcohol, and cigarettes, among all ages surveyed; hallucinogens, Ritalin, OxyContin, bath salts, and over-the-counter cough medicines among 8th and 10th graders; cocaine among 8th and 12th graders; and prescription pain relievers (narcotics other than heroin), sedatives and crystal meth in 12th graders (the only grade sampled for these substances). 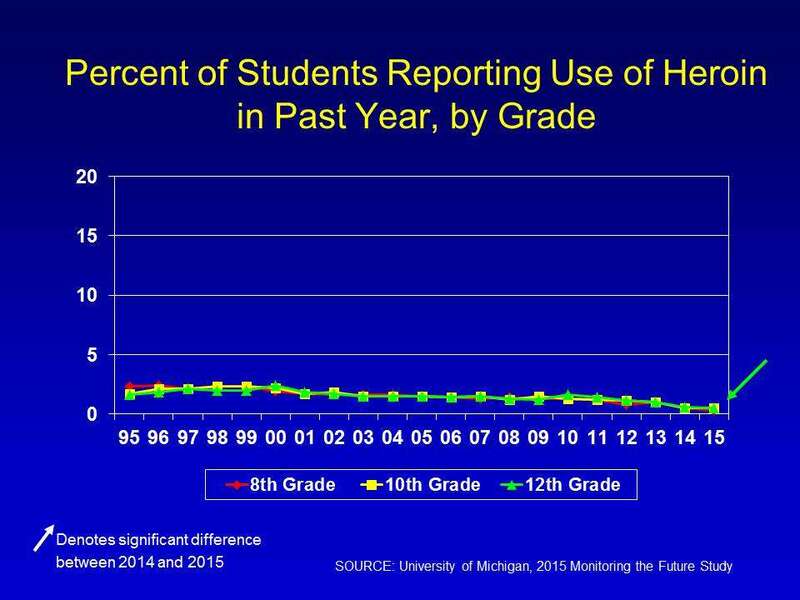 Past-year use of illicit drugs was reported by 23.6 percent of 12th graders. 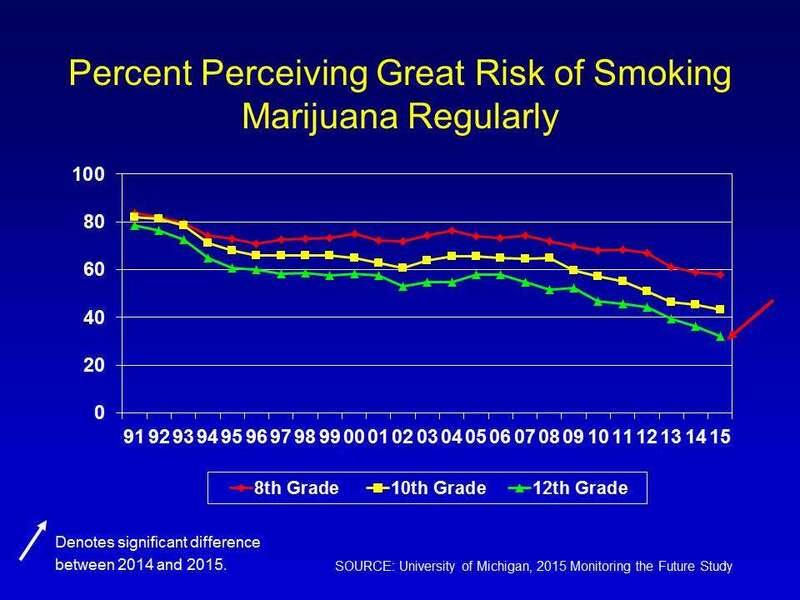 Marijuana use remained steady among 8th, 10th, and 12th graders over the past 5 years despite softening of perceived risks. Past-month use of smoked marijuana remained steady among 8th graders at 6.5 percent, 10th graders at 14.8 percent, and 12th graders at 21.3 percent. 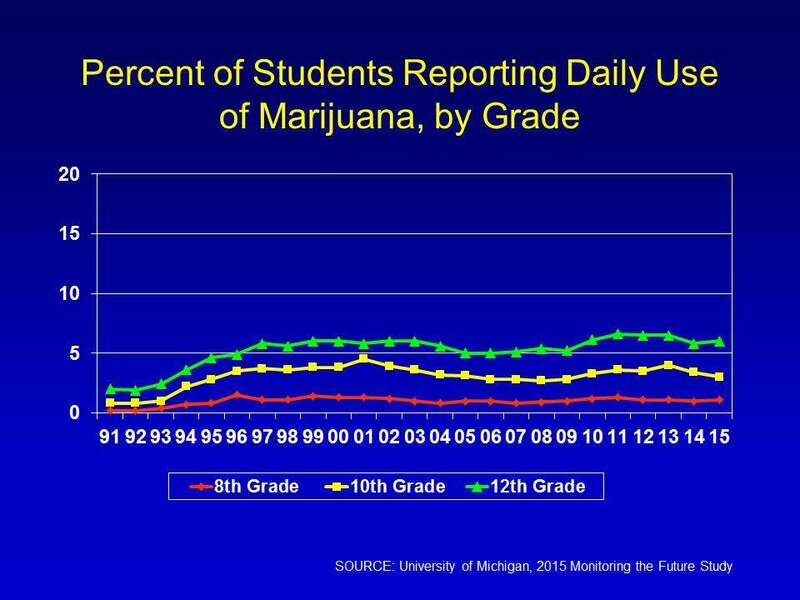 Six percent of 12th graders report daily use of marijuana. The majority of high school seniors do not think occasional marijuana smoking is harmful, with only 31.9 percent saying that regular use puts the user at great risk compared to 78.6 percent in 1991. 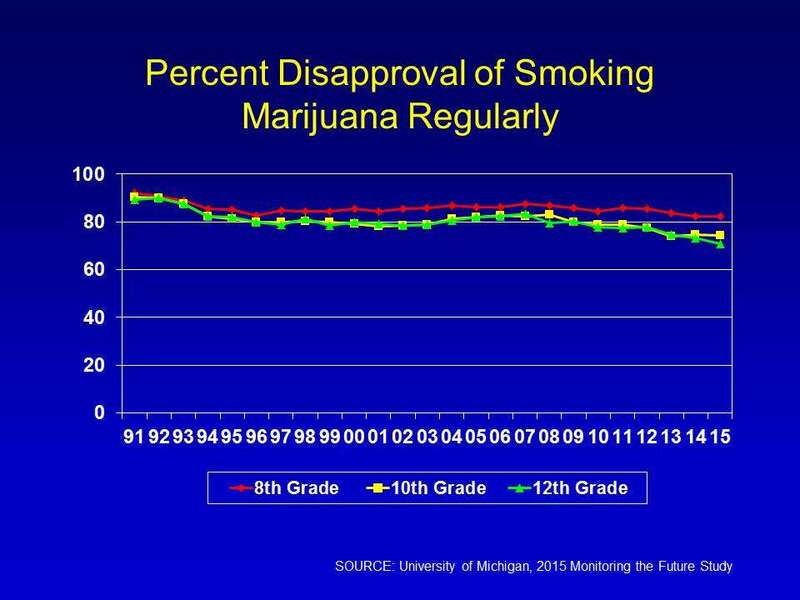 However, disapproval of regularly smoking marijuana remains relatively high at 70.7 percent among 12th graders, although this rate has gradually declined from a high of 90.1 percent in 1992. There has been a significant decline in past-year use of synthetic cannabinoids (K2/herbal incense, sometimes called “synthetic marijuana”) since the survey has been tracking its use. 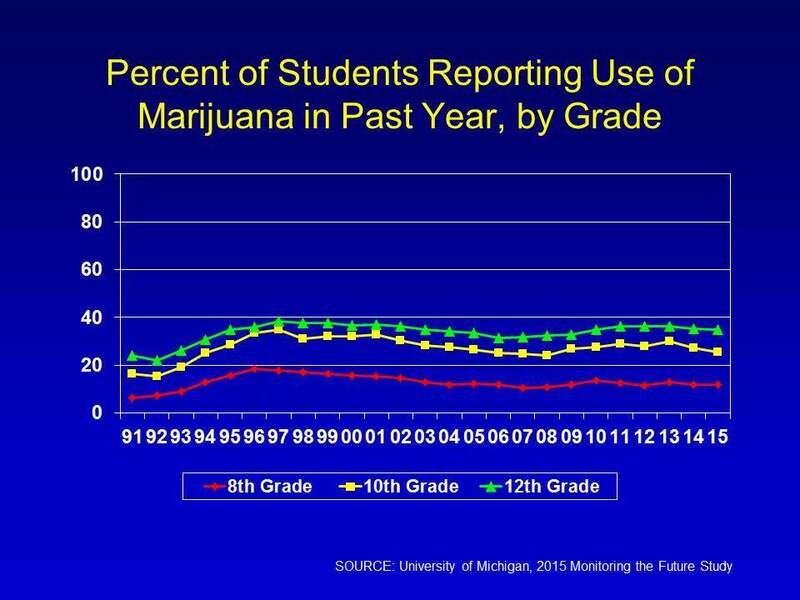 Only 5.2 percent of 12th graders reported its use this year, compared to 11.3 percent in 2012. 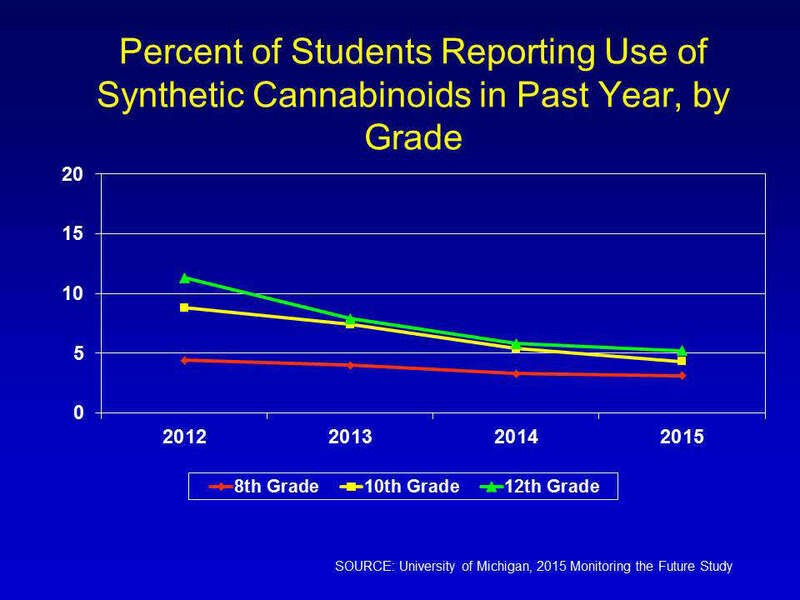 This is associated with an increase, over the same period, in the perceived risk of taking synthetic marijuana once or twice among 12th graders. 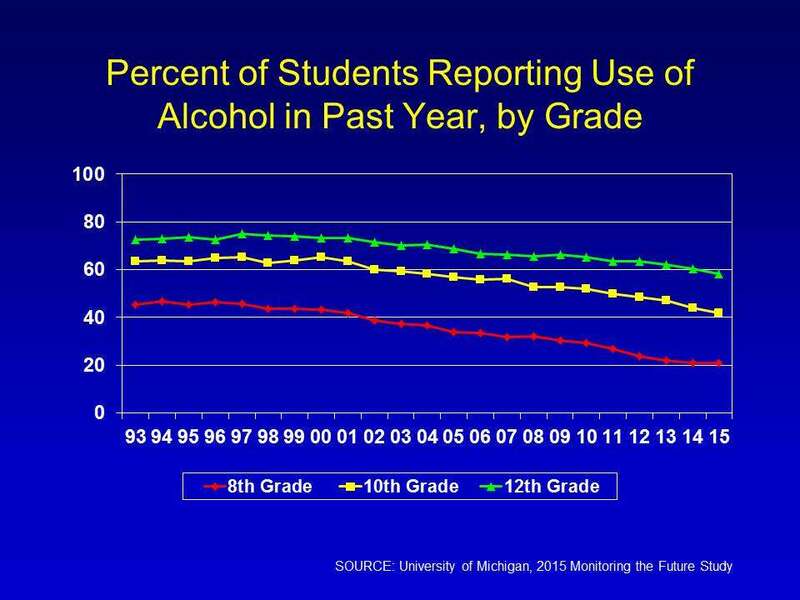 Five-year trends continue to show significant decreases in alcohol use among all grades. Past-month use of alcohol was 9.7 percent, 21.5 percent, and 35.3 percent of 8th, 10th and 12th graders, respectively, compared to 5 years ago, with rates at 13.8 percent, 28.9 percent, and 41.2 percent in 2010. 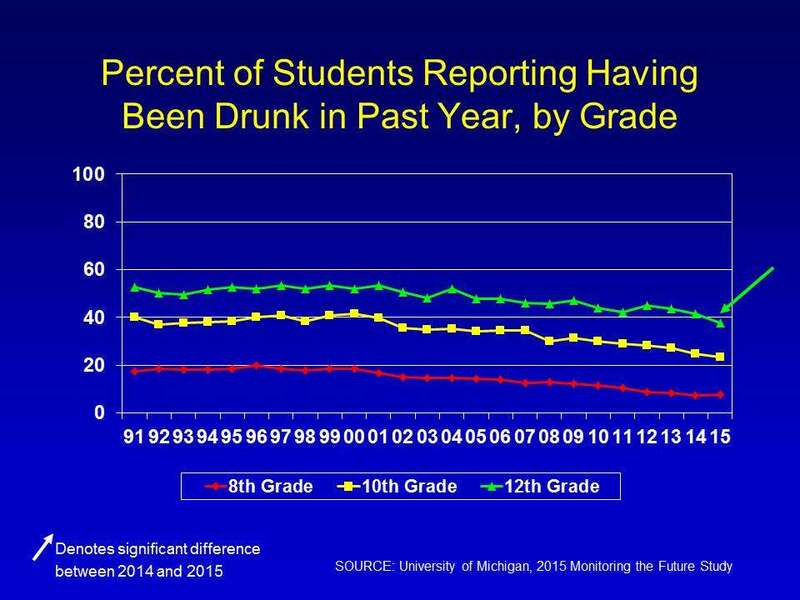 There was also a significant drop in daily use of alcohol among 10th graders, in 12th grade students reporting being drunk in the past year, and in binge drinking among 10th and 12th graders. 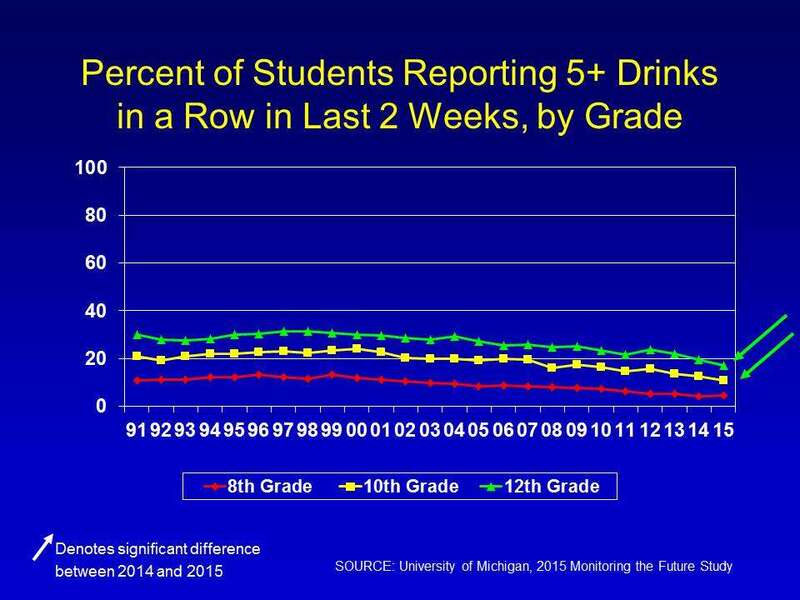 The binge drinking rate represents the percentage of students who reported consuming five or more drinks in a row sometime in the last 2 weeks. 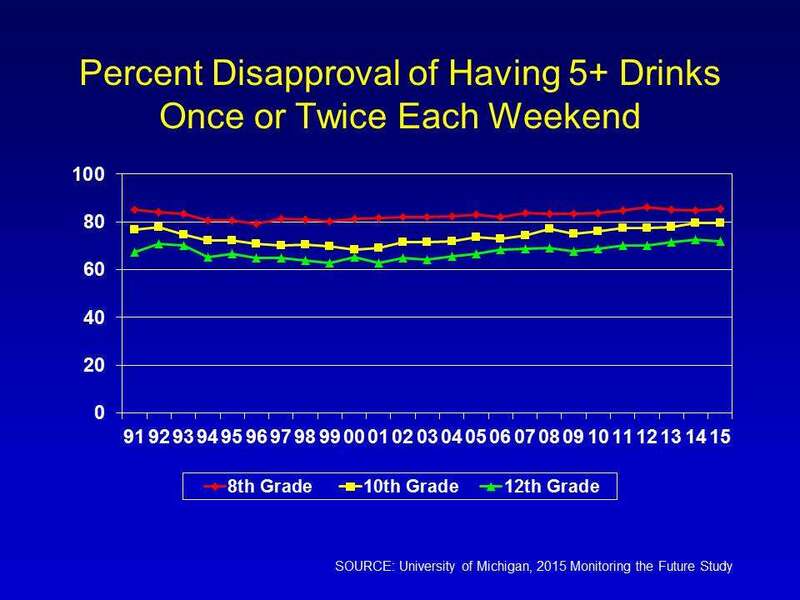 Rates of disapproval of binge drinking remained high at 71.9 percent among 12th graders. Cigarette smoking continues to drop and is currently at its lowest rate in the survey’s history. 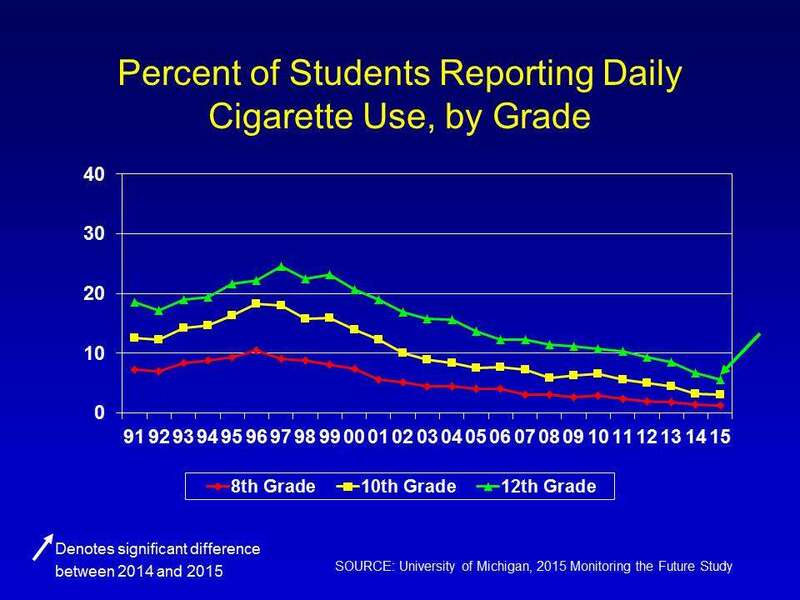 Daily cigarette smoking decreased to 1.3 percent among 8th graders, compared to 2.9 percent 5 years ago; to 3.0 percent among 10th graders, compared to 6.6 percent 5 years ago; and to 5.5 percent among high school seniors, down from 6.7 percent last year and 10.7 percent in 2010. Daily smoking rates among seniors peaked in 1997 at nearly 25 percent. Among 10th graders, there was a significant drop in perceived availability of cigarettes, with 66.6 percent saying they are fairly or very easy to obtain, compared to last year’s 69.0 percent. There was an increase in the percent of 8th and 10th graders who view regular e-cigarette use as harmful, to 18.5 and 17.0 percent respectively, and in the percentage of 8th and 10th graders who disapprove of using e-cigarettes regularly, to 65.0 and 59.9 percent respectively. 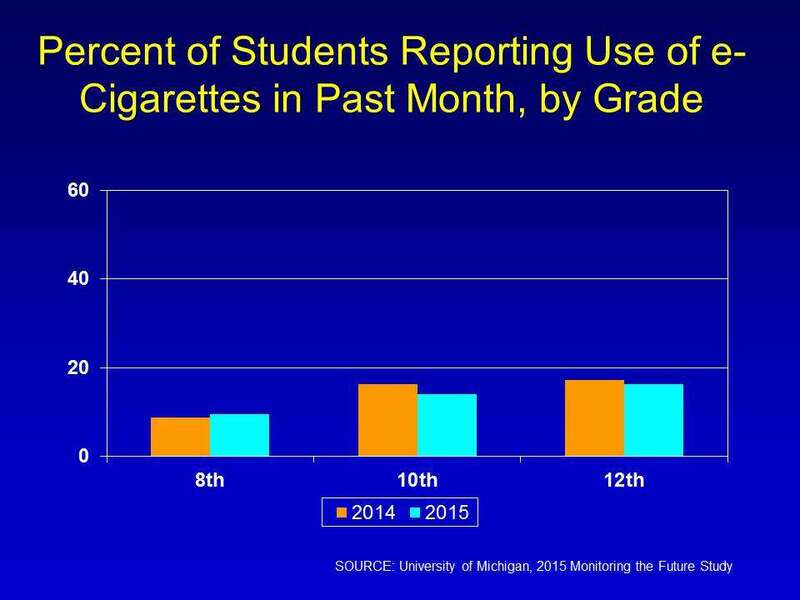 Measured for the first time in the MTF survey in 2014, the use of e-cigarettes remains high among teens with 9.5 percent of 8th graders, 14.0 percent of 10th graders, and 16.2 percent of 12th graders reporting using e-cigarettes in the past month. 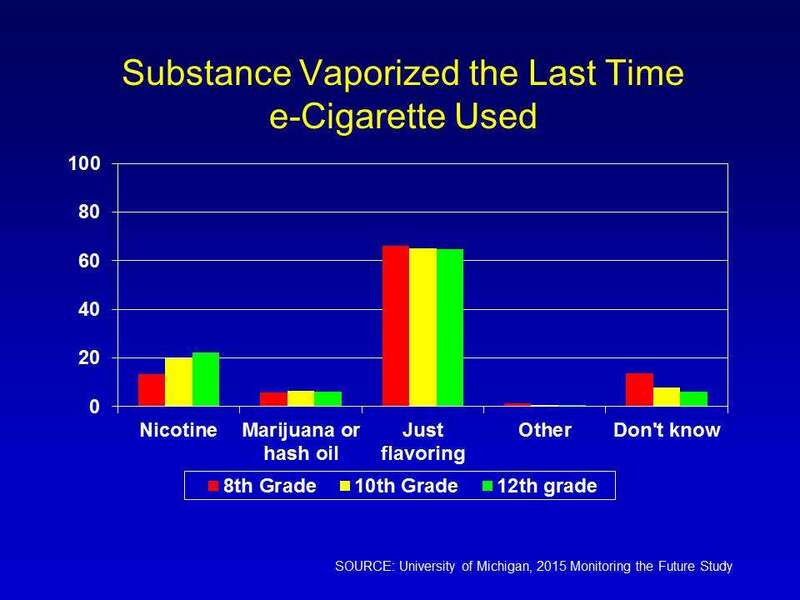 For the first time, students were asked about what they vaporized the last time they used an e-cigarette. A significant majority (over 60 percent across all grades) reported vaporizing “just flavoring.” Among high school seniors, 22.2 percent reported inhaling nicotine, 6.1 percent reported inhaling marijuana or hash oil, and 6.3 percent indicated that they did not know what they inhaled. However, some products labeled nicotine-free may actually contain nicotine. The nicotine in e-cigarettes is vaporized and inhaled (not smoked), however, the health impact of e-cigarette use is not yet clear, and early evidence suggests that e-cigarette use may serve as an introductory product for youth who then go on to use other tobacco products, including conventional cigarettes (Rigotti, 2015). 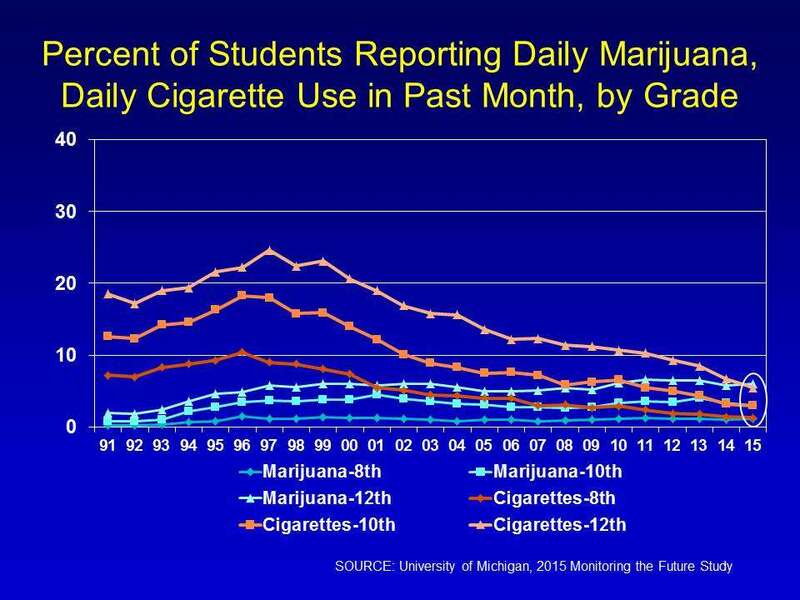 Past-month marijuana use continues to exceed cigarette use among high school seniors. In 2015, 21.3 percent of high school seniors used marijuana in the past 30 days compared with 11.4 percent who smoked cigarettes. In 2015, for the first time, daily cigarette use (5.5 percent) was lower than daily marijuana use (6 percent) among high school seniors. Among high school seniors, 79.5 percent say it is easy to get marijuana. Rigotti NA. 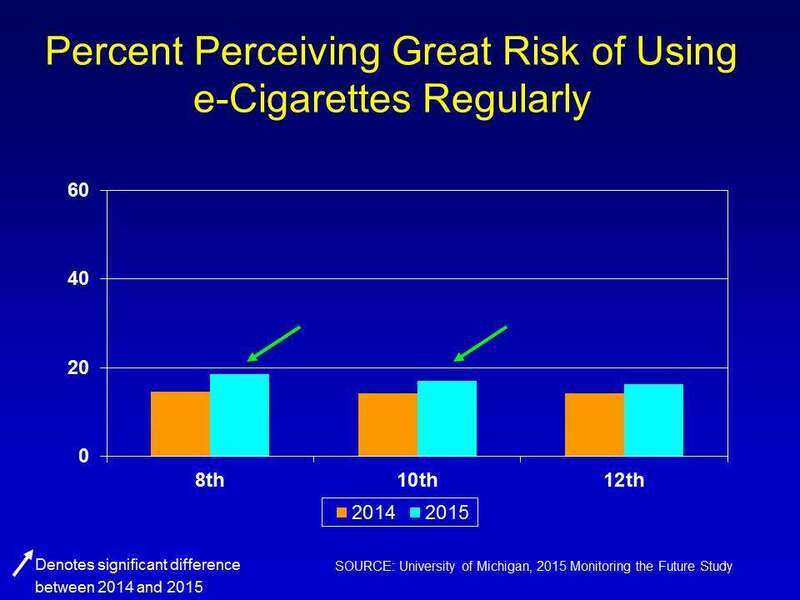 e-Cigarette use and subsequent tobacco use by adolescents: new evidence about a potential risk of e-cigarettes. JAMA. 2015;314(7):673-674.